The San Diego Padres are the new beneficiaries of one of baseball's hidden gems. In a trade that seems less popular than Sarah Palin at a PETA fund raising event. The St. Louis Cardinal traded one of their most consistent offensive players, Ryan Ludwick, for a pitcher who is as exciting as attending an insurance seminar. In what was a three team trade between the Padres, Cardinals and the Cleveland Indians, St. Louis is now the tepid owner of 32 year old right handed hurler Jake Westbrook. A 10 year veteran and a career sub .500 sinker ball pitcher. Get out the champagne, so that I can drink enough to forget this trade! Westbrook, the former Cleveland Indian has been the definition of mediocrity most every year that he has pitched in the big leagues. He is 69-71 lifetime with a 4.34 E.R.A. He is not a strikeout pitcher to put it mildly. Although he does devour innings, the most K's he has ever totaled in one season was 116 after eating up 215.2 innings in 2004, his best year in the majors. That season he had a 3.83 earned run average and a respectable 14-9 record. This year he is 6-7 with a 4.65 E.R.A. in 127.2 innings pitched while fanning just 73 batters. Unspectacular to say the least. Wait, it gets better. Cy Westbrook, I mean Jake is just two seasons removed from having Tommy John surgery causing him to miss the entire 2009 campaign. Having to part with Ryan Ludwick to acquire Mr. Mediocrity is very disappointing. Ludwick's bat has generated some clutch hits during the last 3 1/2 seasons and his approach to the game was that of dedication and professionalism. Watching #47 play you just knew that he was always giving 100% both at the plate and in the field. After scoring just 1 run in 18 innings before Saturday's mauling of pathetic Pittsburgh and being shut out 4-0 by a struggling New York Met team for the 10th time this season, was giving up our 3rd best offensive player the right move? The former All Star's career averages are not average at all. If you took his lifetime stats and averaged them out into a 162 game season his totals would be as follows. 80 runs scored, 27 home runs, 96 RBI's and a .272 average. Comparable if not surpassing some of baseball's better rightfielders. Philadelphia Phillies Jayson Werth, one of the brightest new stars in the National League averages 87 runs annually, 24 hr's, 85 RBI's and a .269 batting mark. Another All Star in Los Angeles, Dodger rightfielder Matt Kemp tallies 93 runs, 22 homers, 85 RBI's and a .292 clip. And the Indian's talented Shin Sin-Choo who patrols right field in Cleveland has similar stats for his career averages. Batting .295 while crossing the plate 94 times a season, with 20 round trippers and 91 ribbies. Ludwick averages more RBI's and home runs then all three of these elite All Star outfielders and would probably have even more inflated numbers if Cardinal manager Tony LaRussa would have played him more consistently. 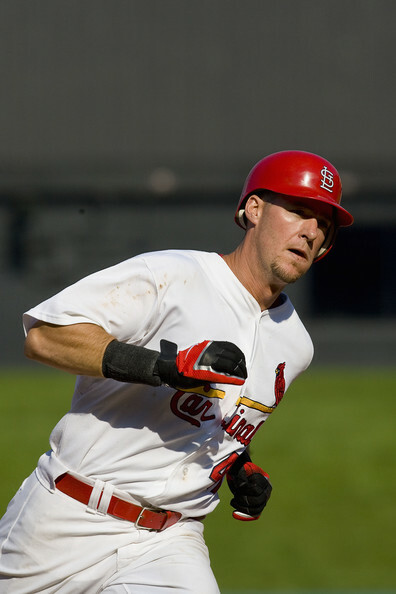 In 2008, Ludwick's only full season in which he had 617 plate appearances he hit .299, scored 104 times clubbed 40 doubles, 37 dingers and drove in 113 runs. That is what we just traded away to get Jake Westbrook? During the 2008 and 2009 seasons combined Matt Holliday, the Cardinals overpaid leftfielder has 201 runs scored, 49 home runs and 197 runs batted in. Ludwick during that same time scored 167 runs, hit 59 round trippers and drove in an impressive 210 runs. Again you must factor in the idea that if LaRussa would have started Ludwick more consistently during his overlooked and under appreciated time here in town those stats would have been even greater. I just don't understand the logic behind a move like this. The explanation"well we had to get something for Ludwick before the organization would be unable to sign him after this season and we would get nothing for him," is silly. To me that does not justify this lopsided swap. In this intance I believe that nothing was a better option than this something! Westbrook is another average junk ball starting pitcher that may eat up a few extra innings at best. Definitely not the difference maker that the Cardinals were wanting to acquire this summer. We gave up too much offense for a back of the rotation starter. Hoping that Yoda Duncan might be able to pull out one more miracle from his reclamation project hat. I feel that not only was Ryan Ludwick cheated by not being able to continue to play for this great city, but I believe that the fans are getting the worst end of this trade. There has been rumors that LaRussa and Ludwick did not always see eye to eye. Big surprise there, huh? Not to the degree of the Scott Rolen incident in 2006, but there was a supposed underlying tension between these two men. Stemming from Ludwick's inconsistent playing time, the player suggested in 2009 that he deserved more of an opportunity, and in the United States of LaRussa that is a giant mistake. Unless you are a homeless Calico cat or an orphaned Dalmation you are not immune to Tony's wrath. Hell hath no fury like a Tony scorned. Ask Ozzie Smith, Jim Edmonds, Kerry Robinson and Scott Rolen. Hopefully this deal was not the product of pride or I would have to liken LaRussa to Benedict Arnold. The infamous Revolutionary war General. There is a good chance that we may have to face the San Diego Padres in October if Old Abner has anything to say about Cardinal fate. I am certain that the competitive Ludwick would relish the opportunity to pay back his ex-manager, who in my opinion was the catalyst for this deal getting finished. If that happens, LaRussa like the traitor Benedict Arnold, should consider putting on another uniform himself.